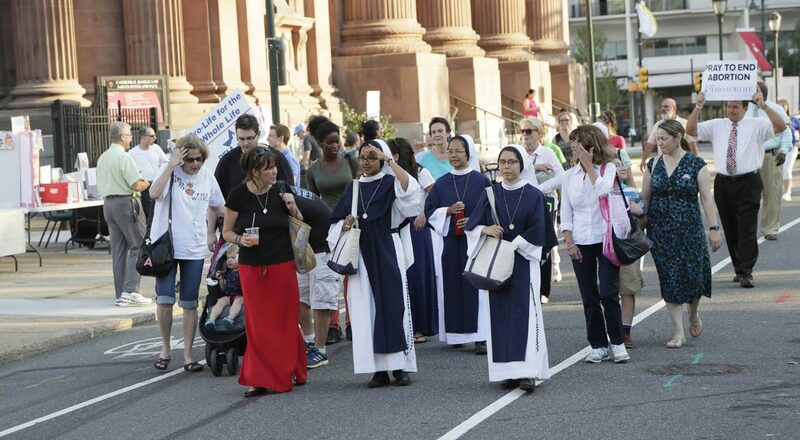 Walk draws young people for prayer and pro-life witness in Phila. Participants in the third annual Walk for Life Sept. 24 walk around the Cathedral Basilica of SS. Peter and Paul in Philadelphia. Despite unusually warm weather, scores of faithful including youths from high school, college and young adult groups throughout the area gathered for the third annual Walk for Life on Sunday, Sept. 24 at Sister Cities Park across 18th Street from the Cathedral Basilica of SS. Peter and Paul in center city Philadelphia. This year’s rally featured music from recording artist Teresa Peterson, a parishioner of St. Francis Xavier Parish – the Oratory in nearby Fairmount. Peterson encouraged participants to have faith and hope in the midst of a chaotic world. Steve Bozza, director of the archdiocese’s Office for Life and Family, told the crowd that the doors of the church “will always be open” to offer God’s mercy to those who need healing. When planning the event back in January, Bozza sought speakers he thought were “passionate and dynamic” for this year’s walk. He tapped two prominent leaders in the pro-life movement, Kristan Hawkins and Shawn Carney, both of whom have received national attention for their work. Hawkins is the director of Students for Life of America, which has clubs in hundreds of school and college campuses across the United States. In her talk she described how a high-school volunteer project altered the course of her life. After managing the center’s supplies and working on its newsletter, Hawkins ultimately ended up counseling women who were seeking alternatives to abortion. Shawn Carney, founder of the 40 Days for Life campaign, traveled from Texas to speak at the event. Begun in 2007 by a small prayer group, the organization now leads prayer vigils and community outreach to promote pro-life awareness at a grassroots level. “Our culture has forgotten the joy of the family and the great gifts children bring to society,” Carney said. 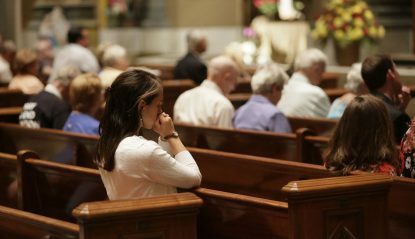 A young woman attends the holy hour and Mass that followed the third annual Walk for Life on Sept. 24 at the Cathedral Basilica of Ss. Peter and Paul, Philadelphia. Carney said 40 Days for Life has helped to save more than 13,000 unborn children from being aborted, while promoting a deeper appreciation of the value of human life in 40 countries. “The best way to end abortion is the use of our faith,” he said. The rally concluded with a procession around the cathedral, followed by a holy hour and a recitation of the Divine Mercy chaplet. Participants then attended Sunday evening Mass, which was celebrated by Archbishop Charles J. Chaput. In his homily the archbishop asked those gathered to recommit themselves to change the world, and that the Lord was walking with them. Emily Sheray, a parishioner of St. Patrick Parish in Philadelphia and a recent graduate of Notre Dame University, was inspired by the rally.